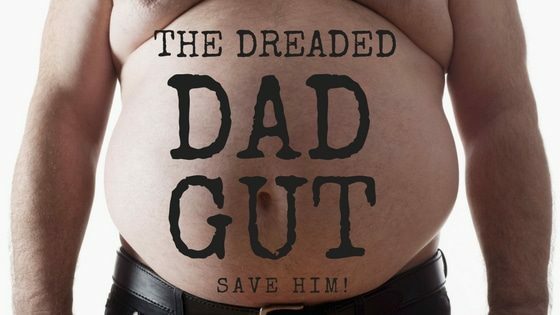 Dad Gut: Save Him With These Tips! If your dad or partner is proud of his ever-expanding ’beer belly’ AKA ‘Dad Gut’, your job (as someone who loves him & can see the expansion happening) is to save him from the underlying insulin resistance & inflammation that is causing it! Getting him to use the Blend11 & PondWater daily are a great start, but here are a few more tips to help him along! Increase his fibre in general – keep the gut humming along nicely to improve detoxification, maximise production of gut-healing, anti-inflammatory SCFA’s by the gut microbes & also keep him feeling full. Make sure his daily protein intake is adequate for his workload & muscle mass (ask a personal trainer to help with this). Too little protein will mean his lean muscle tissue is constantly getting broken down (not good) & too much will just end up being converted to fat (also not good). Good fats. Oily fish, avocado, nuts & seeds, olive oil, coconut…fats will keep him satisfied & feeling full, and some can help decrease inflammation in the body. You may also see improvements in his skin, joints & mood when you focus on fat. Decrease alcohol intake (they don’t call it a beer gut for nothing!) The best options as far as ‘dad-guts’ go, if he likes a drink sometimes are spirits (in moderation) on the rocks or mixed into a sparkling mineral water, or a small glass of wine (that’s glass, not bottle). Exercise is MANdatory! He needs to focus on building more muscle (lifting weights or doing some type of resistance training), plus some cardio / endurance work as well, i.e. walking first thing in the morning & / or after dinner. With the weight training, get advice from an experienced personal trainer, who knows how to work with older guys to avoid the possibility of injury & maximise results safely. The more muscle mass he can build, the more he can relax with his diet as the muscles will keep his metabolism cranking / burning efficiently through what he eats. Better all-over strength & mobility will also decrease his risk of back / neck / knee injuries / shoulder pain etc – all really annoying & common dad issues. Don’t sit for too long – dad MUST get up & take breaks to move every half hr or so if his work is sedentary. Man was NOT designed to sit all day! Incorporate a quick lunchbreak walk or mini workout, embrace any stairs, hills or heavy things to lift as part of the working day. Nobody needs a gym or any fancy equipment to work their muscles, just use body weight & the things around you.. Try intermittent fasting. Eating breakfast later suits many men, or some prefer skipping lunch or dinner. This works well for men who are not burning a lot of calories throughout their day, but active blokes may struggle. Experiment & do what works best, but the goal is to try & give your gut a decent break somewhere from food constantly coming in! Eat dinner earlier. This gives you a longer period of fasting between meals, which is good for improving insulin sensitivity. Be very careful with desserts & sweet treats – only eat these just before or just after doing some serious exercise! And replace indulgences with more nutritious versions. Ie unsweetened yoghurt & berries instead of icecream, a protein ball instead of a few choccy biscuits…there are so many better alternatives that can still satisfy your need for a treat! Include nuts & seeds, green tea, cinnamon, turmeric, aloe vera, fenugreek, oily fish & vinegar in the diet (these foods can all help improve your ability to handle sugars & many are also great gut support & anti-inflammatories). Stock up & get ideas on how to use these from the staff in your local healthfood store. Include probiotic-rich foods in your diet daily, & / or use a quality multi-strain supplement. Good gut health = smaller dad gut! Ensure dad is getting plenty of magnesium – really important for insulin sensitivity & an extremely common nutrient deficiency. Try a regular magnesium spray or a soak, esp good if his ‘dad-back’ is sore or the poor old ‘dad-muscles’ are overworked, or – heaven forbid – he is suffering from the man-flu. Let me know if you’ve tried anything of these or have something thats worked well for you. Just make a comment below or send me an email.